I’ve been getting some emails asking for course notes for fluxus workshops, I don’t really have anything as structured as that but I thought it would be good to document something here. I usually pretty much follow the first part of the fluxus manual pretty closely, trying to flip between visually playful parts and programming concepts. I’ve taught this to teenagers, unemployed people, masters students, professors and artists – it’s very much aimed at first time programmers. I’m also less interested in churning out fluxus users, and more motivated by using it as an introduction to algorithms and programming in general. Generally it’s good to start with an introduction to livecoding, where fluxus comes from, who uses it and what for. I’ve also started discussing the political implications of software and algorithmic literacy too. Scheme as calculator – parentheses and nesting simple expressions. Naming processes with define to make procedures. A new procedure to draw a cube. Mouse camera controls, move around the cube. Different built in shapes, drawing a sphere, cylinder, torus. Multiple objects, graphics state persistent like changing a “pen colour”. Transform state is applicative (scale multiplies etc). Then tackle recursion, in order to reduce the size of the code, and make much more complex objects possible. Make it bend with small rotation. At this point they know enough to be able play with what they’ve learnt for a while, making procedural patterns and animated shapes. After this it’s quite easy to explain how to add another call to create tree recursion, and scope state using (with-state) and it all goes fractal crazy. This is generally enough for a 2 hour taster workshop. If there is more time, then I go into the scene graph and explain how primitives are built from points, faces and show how texture coords work etc. Also the physics system is great to show as it’s simple to get very different kinds of results. In this workshop for beginners with award winning game designer, creative coder and live coding artist Dave Griffiths you will find out about the emerging art form of live coding and learn how to write simple programmes to create animations in 3D space. 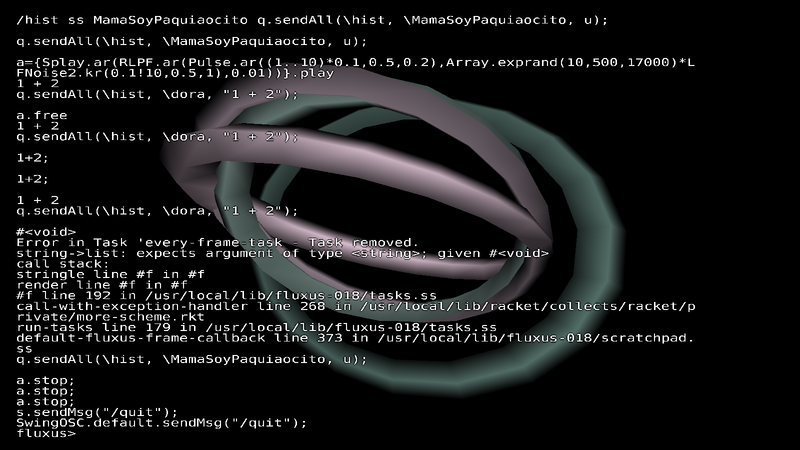 You will be introduced to fluxus, an open source game engine for live coding worlds into existence, used by artists, performers and digital practitioners for installations, VJing, games and education. What will you do? What will you achieve? You will create 3D animated forms, and have an introduction to fundamental programming concepts, naming of values and processes, recursion and digital representation of colour, 3D shape and texture. There will be coffees and teas. Speakers: creative coder Dave Griffiths is joined by digital archaeologist Tom Goskar. 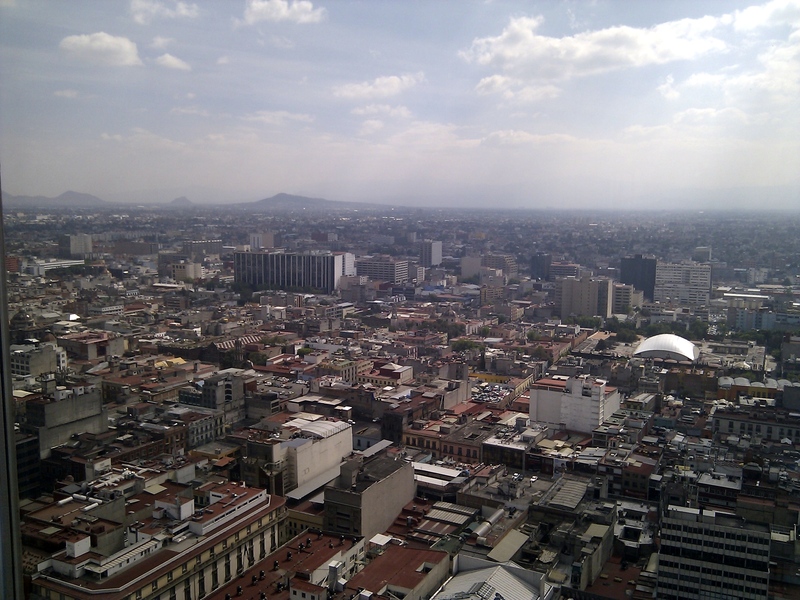 A script for sniffing bits of supercollider code being broadcast as livecoding history over a network and re-interpreting them as objects in fluxus, written during an excellent workshop by Alberto de Campo and Julian Rohrhuber at /*VIVO*/ Mexico City. 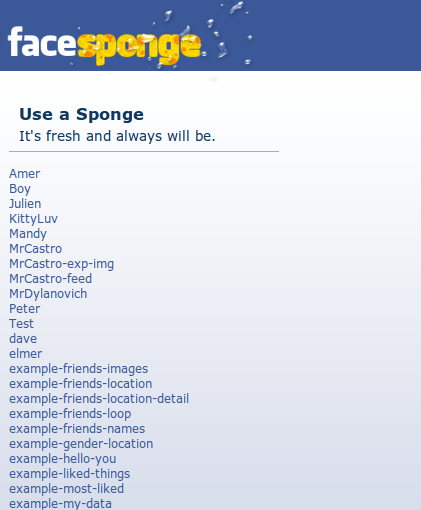 So, like the previous workshop at CCCB, we centred this around a web application called FaceSponge, which we developed as a social programming interface giving quick access to the Facebook API and allowing participants to try out each other’s scripts. The other key issue was to find out people’s opinions, and so we collected answers on post-it’s to three questions for each area, which the participants later sorted for presentation to the public. 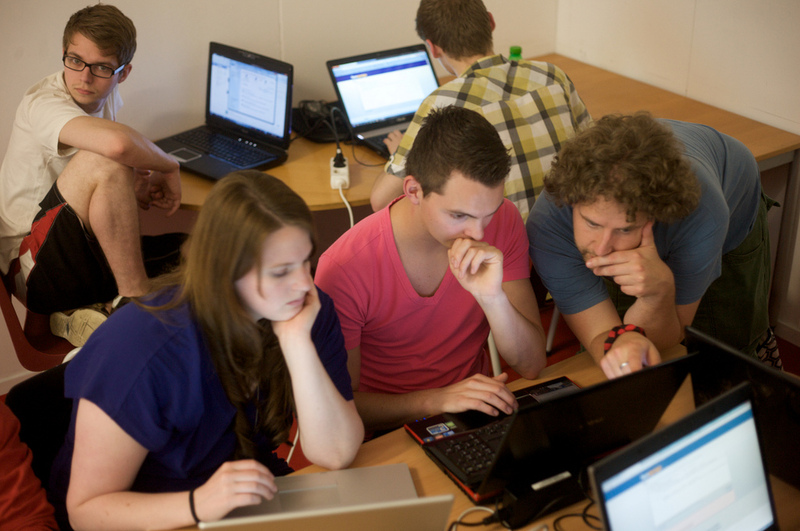 This workshop was perfectly timed with Facebook’s IPO, and as 82% of it’s revenue comes from advertising we started off by working on a simple spoof advert. We took one friend, and picked something they have ‘liked’ and wrote some code to promote it. This is what happens on social networks where a brand gets advertised to you because one of your friends follows or likes it. Being able to put a friend’s name in an advert is seen as an exciting future of advertising (or perhaps less so as the share price continues to drop). There are vast amounts of pictures available on facebook, and it was fun to write a script that presented them all back at in a chaotic manner without any other information. This also gave us a chance to show how the privacy on Facebook is imaginary, as the URL’s FB gives you for your friend’s pictures are public – regardless of anyone’s privacy settings. // you think your photos are private? We continued to play with and adapt these scripts in order to show more information. The mood was interesting as it flipped from serious to hilarity and then slight awkwardness at what we were dredging up. We followed each of these practical sessions by collecting feedback on thoughts and emotions for each section. Although this was a very demanding workshop (changing between coding, politics, funny juxtapositions of friend’s personal data and having to think about how it felt) we recorded a wide range of thoughts – from the dismissive, “doesn’t matter” to the outright enraged. Perhaps one of the most important aspects of this workshop was being able to expose these mechanisms to groups of people normally considered ‘users’. I was honoured to take part in the live notation unit’s event at the Arnolfini on Friday, and to perform with Alex McLean and Hester Reeve in the evening. Live notation is a project exploring connections between Live Art and Live Coding, both art forms revolving around performance, but with very different cultures and backgrounds. 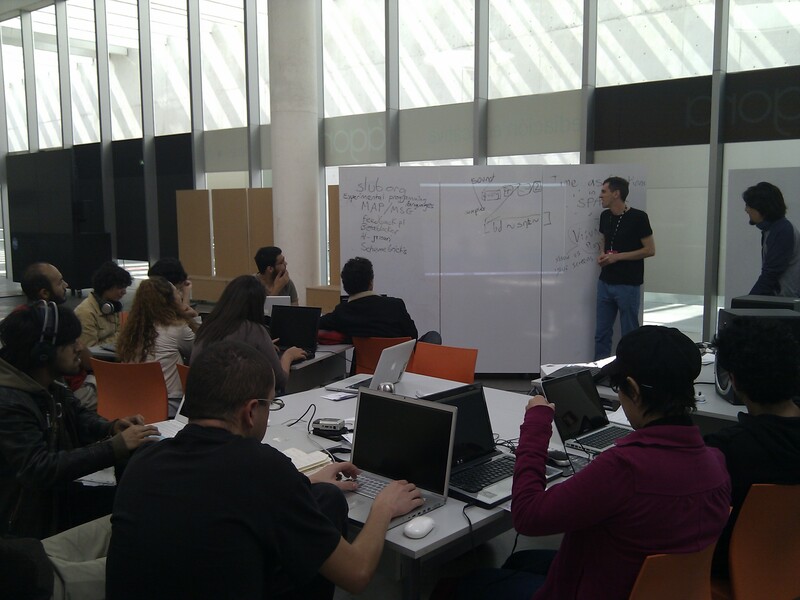 The day started with workshops. The first one by Yuen Fong Ling played with the power structures inherent in Life Drawing. We tried breaking some conventions, instead of everyone drawing the same model – one scenario involved arranging the easels in a line where one person drew the model and everyone else copied the previous person in line. 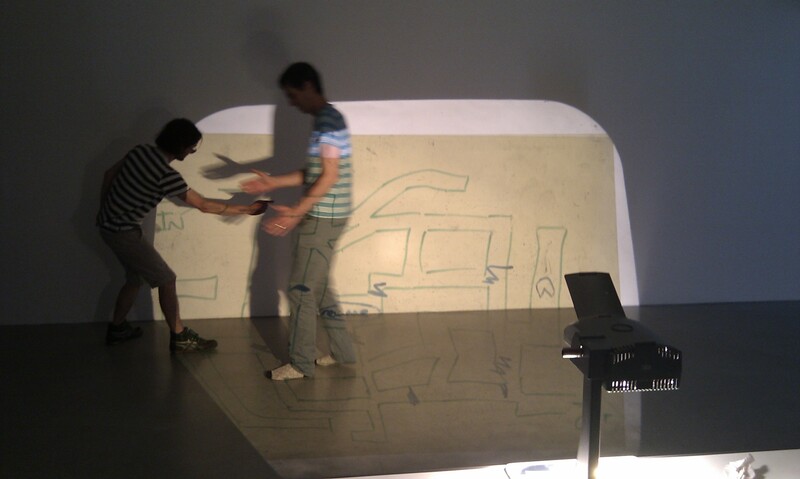 This ‘drawing machine’ resulted in an intriguing pictorial version of “Chinese whispers”. 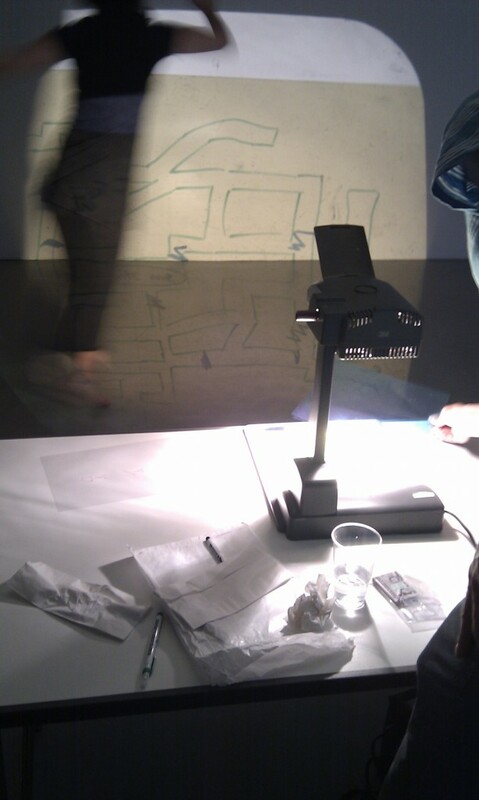 The second workshop involved programming choreography live via drawing and an overhead projector, firstly with workshop leader Kate Sicchio as the dancer, and then more and more livecoders joining in until the roles were reversed. The performances consisted of a mix of live art and livecoding, and also served to demonstrate the breadth of approaches that these art forms represent – Wrongheaded performed a spectacular livecoding invasion of religious ritual, while Kate Sicchio followed beautiful instructions she’d received a couple of hours before interpreting Nicholas Poussin’s painting ‘The Triumph of David’ using brightly coloured silks. Thor Magnusson unleashed a sub bass rumbling agent driven visual approach to livecoding with a very considered minimal performance. As an audience member, I think livecoding needs a dose of cross fertilisation with related areas, especially if they are outside of the computer music sphere – we can think more about our roles, the situation and less about the mechanics. As a performer, I’m still processing (and waiting for photos) and will write a bit more on our performance in a few days. Some great photos by Boudewijn Bollmann from the Naked on Pluto workshop on social media and privacy at Baltan Laboratories last week. A more in depth post about this event coming soon. The next few days are going to be hectic – a train powered scramble between cities for various activities. Enter a rarity cabinet of people and experiments: a lively display of human-plant hybrids, tasty table conversations, crisis-proof clothing and other curios in their natural habitat – the FoAM lab. Expect to experience a colourful collection of sketches and prototypes in various stages of completion, providing an insight into the collaborative and creative processes developed at FoAM. My part is going to involve various experiments with Germination X, some playtesting and getting more feedback so I can evaluate the mandrake avatar changes. I’ve also rebuilt the code for “draw your own plant spirit” – this time we can directly upload people’s drawings to the public server for testing their spirit designs in the game. The second event I’m taking part in is Baltan Laboratories The Tool Series #5: FaceSponge Workshop with Aymeric Mansoux in Eindhoven on Wednesday 23rd. We’ll be examining and exploring our real data on social networks, looking behind the interfaces and protocols we are supposed to see, with a top secret collaborative social network livecoding interface which has emerged from the Naked on Pluto project.